Dark shamans are a special class of mutants that distinguish themselves from the others with the ability to heal. Although a dark shaman does attack with magical waves, which is highly damaging, it is more common to see it healing the nearby mutants that are wounded. Their healing ability makes them the primary target (after lurkers) in combat because it is necessary to stop the other mutants from recovering. When a dark shaman is alone, or if the nearby mutants are at full health, it would attack with shockwaves. If there are wounded mutants nearby, it would heal one of them and stop its own attack. A dark shaman cannot heal itself, although two or more shamans can come together and heal each other. A dark shaman may drop silver and medipacks. 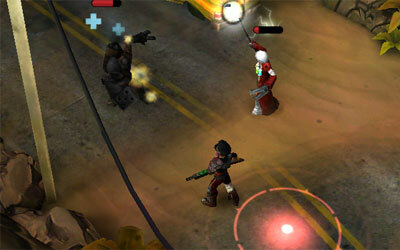 In coop multiplayer, a dark shaman has a base score of 32. As the game suggests, "make dark shamans the primary target in combat". This is crucial as the healing process reverts the damage done to the mutants, rendering your attack useless. So try to look for the dark shamans and take them out first before dealing with other mutants. Only in cases of emergency such as being surrounded by lurkers should you deal with the shamans later. Usually a dark shaman alone is not a major threat as it can be taken out easily when it is busy with the healings. Its slow magical wave attacks can also be dodged rather easily. But things can get much more complicated when there are two or more shamans close by as they can heal each other. In coop multiplayer, situations like this often arise when someone tries to attack a shaman, only to find out the other shaman keeps on healing it, making it an endless repeated process of damaging and healing. 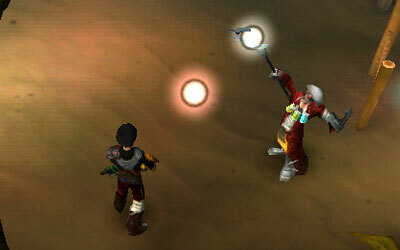 Check out the ways to deal with multiple shamans.